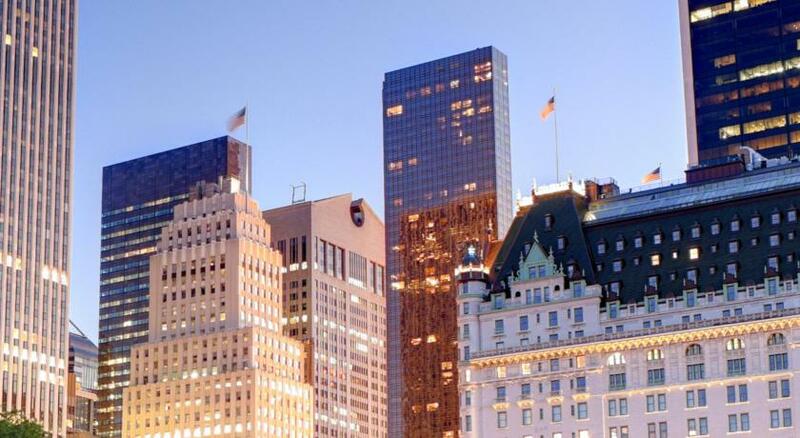 Lock in a great price for Mandarin Oriental New York – rated 8.7 by recent guests! We are from a place of beautiful nature, Santa Barbara. 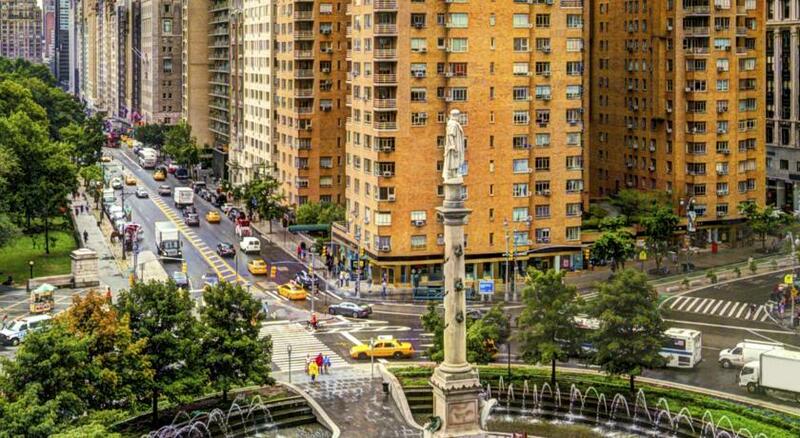 So we prefer staying near Central Park when visiting NYC. We stayed at 3 different hotels this trip., the Surrey, Plaza Athenee, and the Mandarin. 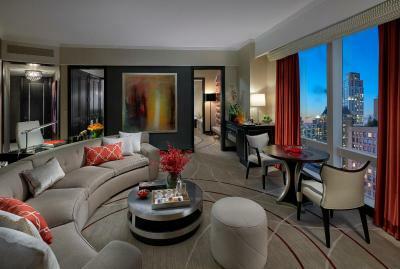 The Mandarin offers the best views of the Park and the River. 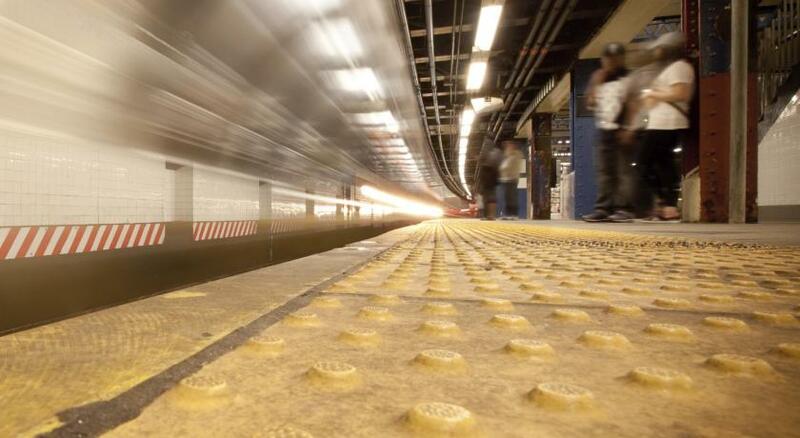 It is also very convenient for going to lower Manhattan. 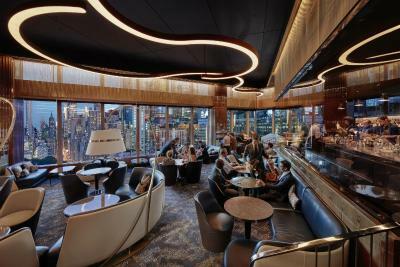 While it is in a very busy location, it feels like a calm oasis because it occupies the top floors 36-54 which provides a reprieve from the noise of the city. 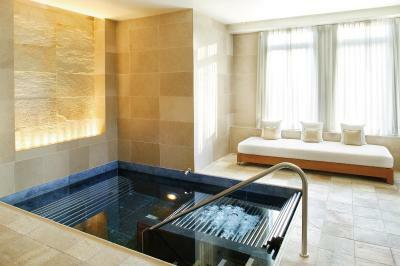 The spa is lovely and my treatment was one of the best I have experienced during my travels. The staff is very attentive and helpful for a larger hotel and I was offered an upgrade on my room when I arrived. 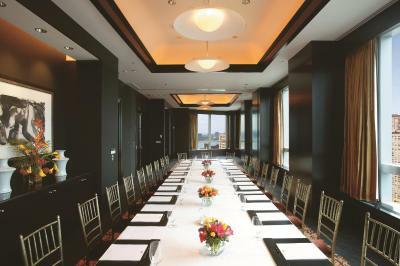 The restaurants are lovely but a bit more formal than other boutique hotels . The staff at check in was extremely sweet and the tea they offered on arrival was a nice touch. 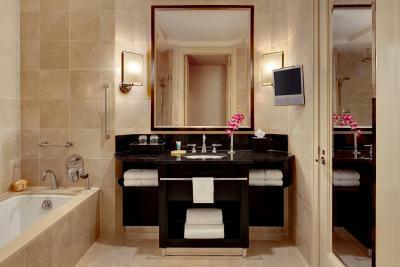 Our bathroom was large with double sinks giving us both ample room to get ready. The views from the restaurant were fantastic. Room was amazing. Staffs are great. View from room was beautiful. Room service is not good ( sorry to say ..). Overall, the hotel staff members were great. Staff remembered we were celebrating an anniversary and sent us bottle of champagne- thoughtful gesture. The actual hotel looked little old and carpets in the hallways and rooms smelled a little bit. However, housekeeping organized room nicely and put things away during turndown service. 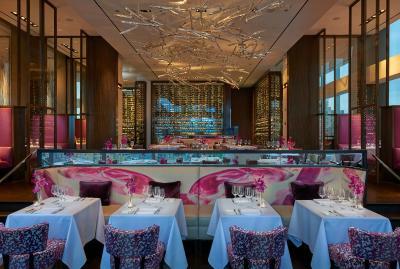 Service at Aviary was slow and waiters were ok, not very attentive at all. Cocktails were nothing special but had very high price tags. The actual space of the Aviary was nice and spacious. Breakfast at Asiate was tasty and wonderful space. Staff at Asiate were nice and attentive. 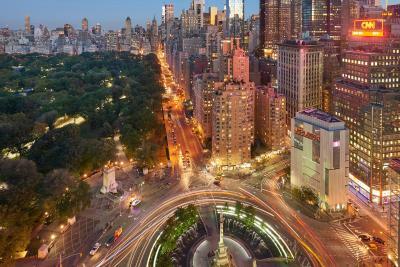 The location of the hotel was excellent- quick and convenient access to other restaurants and shops as well as Central Park. Very clean property. The room was well appointed, and while the workout facilities are small, they were clean and had everyone we needed for a good workout. The sauna is small, but since I was the only person using it was fine for me. 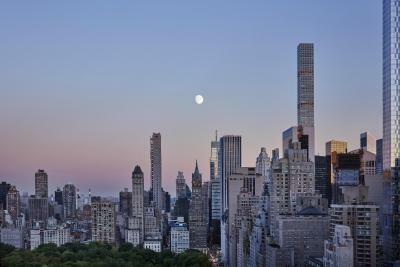 Nice Central Park view (albeit somewhat blocked by the trump hotel). 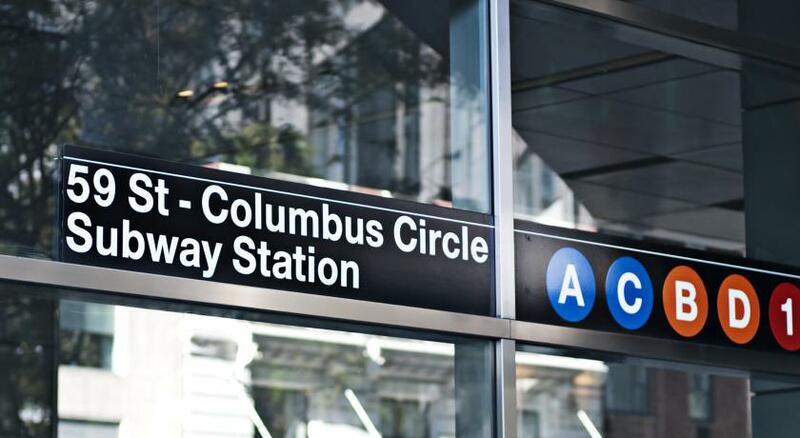 Great location with proximity to all major museums (MoMA, Met, Frick, natural history), Central Park, and a Soulcycle. 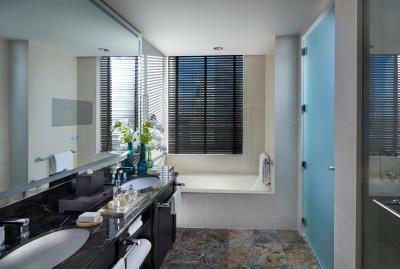 Bathroom and room are sizable. 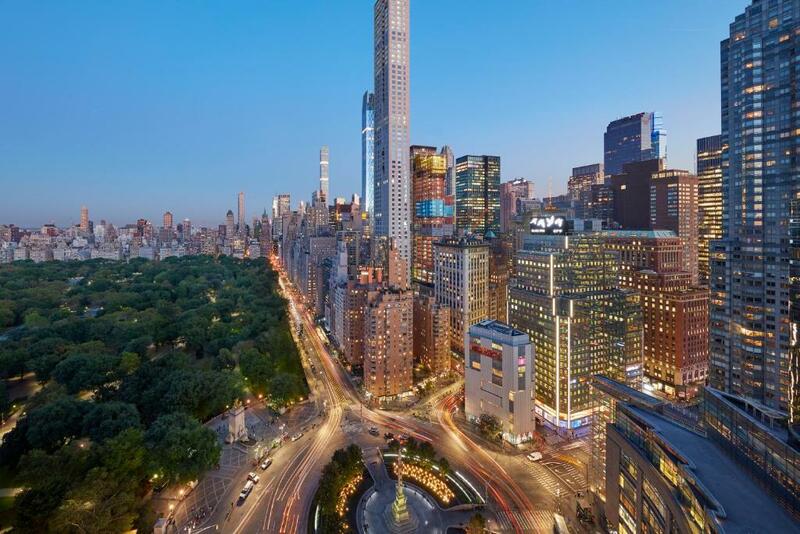 Mandarin Oriental New York This rating is a reflection of how the property compares to the industry standard when it comes to price, facilities and services available. It's based on a self-evaluation by the property. Use this rating to help choose your stay! 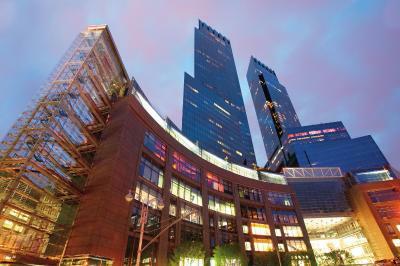 Located at the top of Time Warner Center, this hotel is a 2-minute walk from Central Park. 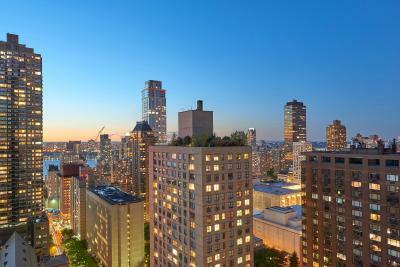 It features a 75-foot indoor pool and offers rooms with panoramic views of Manhattan. 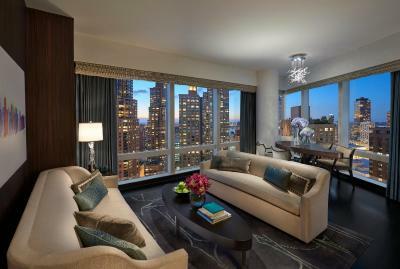 Every room at Mandarin Oriental, New York features floor-to-ceiling windows. Guests can enjoy the 55-inch flat-screen TV. 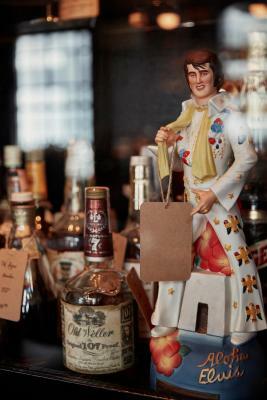 A mini-bar is included and a chocolate and bottle of water are provided each day. 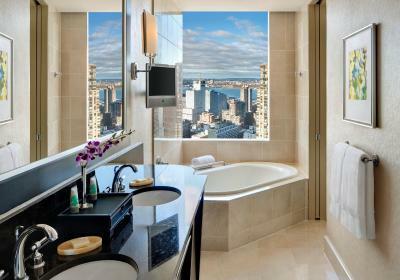 The Mandarin Oriental, New York offers a full-service spa with a sauna and massage rooms. 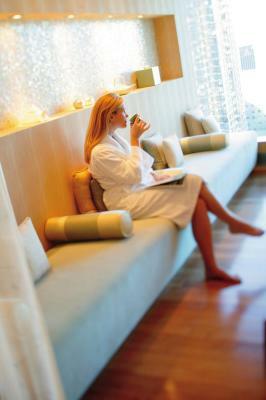 The spa features a Tea Lounge where guests can relax before or after treatment. 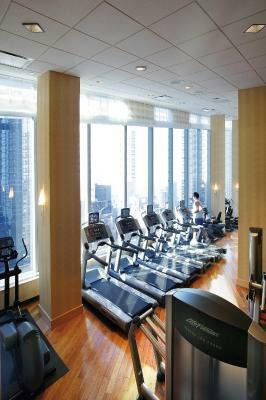 The hotel also provides an on-site fitness center. 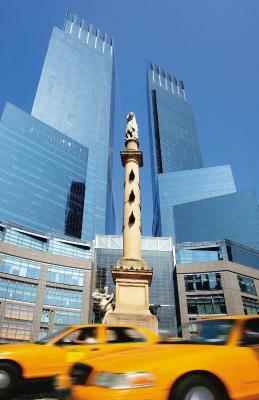 New York City tourist information and ticket services are also available. 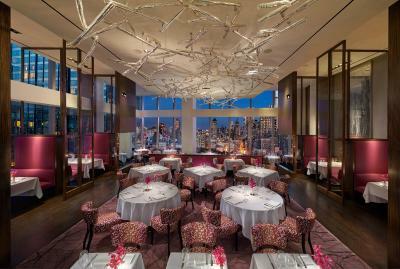 Restaurant Asiate, located on site, serves contemporary cuisine and has wall-to-wall views of Manhattan. The Aviary NYC bar from Chef Grant Achatz, provides an interactive journey for guests, where inventive cocktails and small food plates complement the experience. 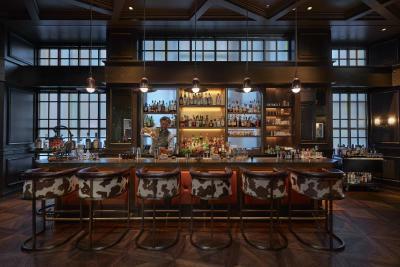 Adjacent to The Aviary NYC, The Office NYC, a speakeasy-style bar, offers classically-inspired food and cocktails. 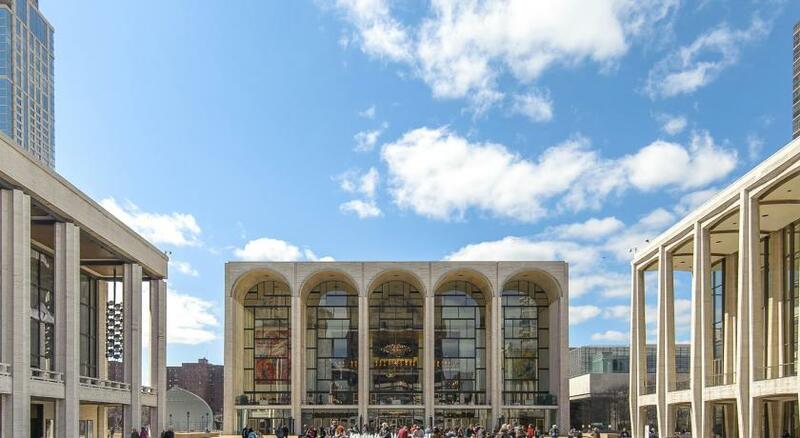 This hotel is within a 10-minute walk of shopping on Fifth Avenue and 1,150 feet from the Museum of Art and Design. 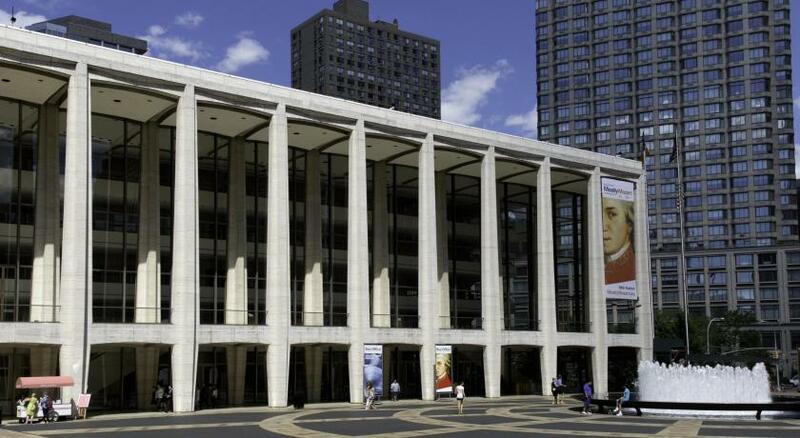 The Museum of Modern Art is 0.7 mi away. 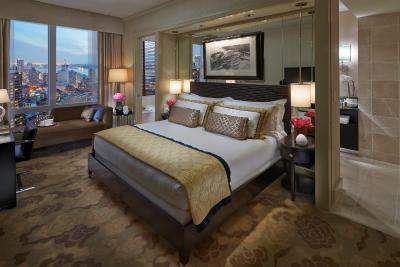 When would you like to stay at Mandarin Oriental New York? 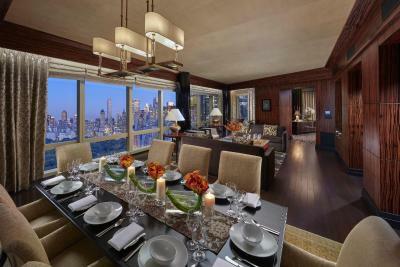 This room features floor-to-ceiling windows and offer views of Central Park. 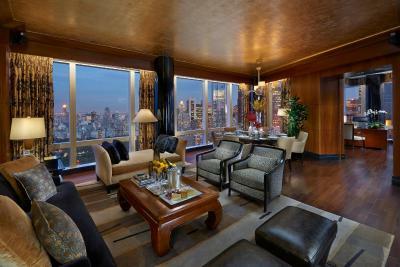 This corner suite features a separate living room and offers panoramic views of the Hudson River and George Washington Bridge. 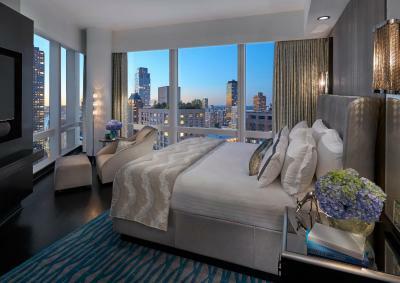 These rooms feature floor-to-ceiling windows and offer views of the Hudson River and New York City skyline. 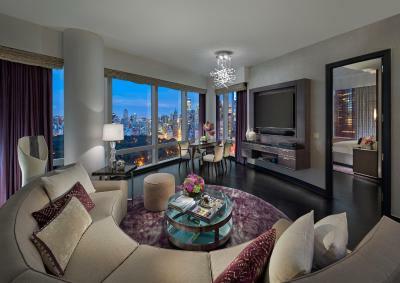 This spacious corner suite features a separate living area and panoramic views of Central Park. 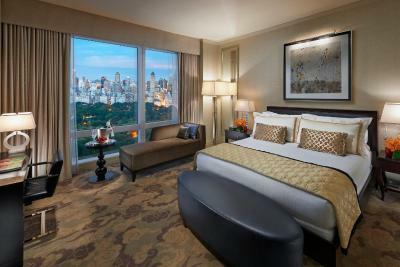 Located on higher floors, these rooms offer views of Central Park and midtown Manhattan. 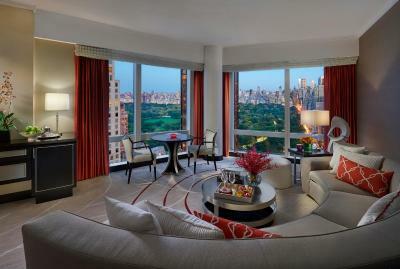 Located on the southeast side of the hotel, these suites feature a separate dining and living room area and views of Central Park. 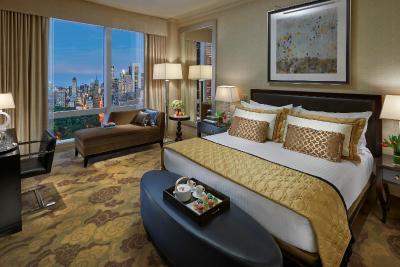 These two-bedroom suites feature a king bedroom connector, separate dining and living room area and views of Central Park. 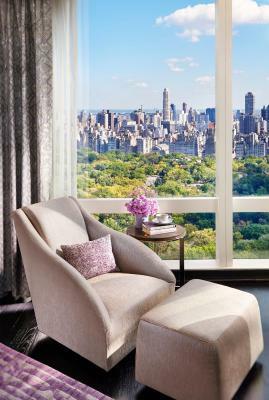 These two-bedroom suites feature a twin bedroom connector, separate dining and living room area and views of Central Park. This twin room features a seating area, air conditioning and flat-screen TV. Perched high above Manhattan at Columbus Circle, Mandarin Oriental, New York features a celebrated restaurant and a world-renowned spa and is the perfect base from which to explore the city while offering the ultimate in service, comfort and style. WiFi is available in public areas and costs USD 15 per 24 hours. 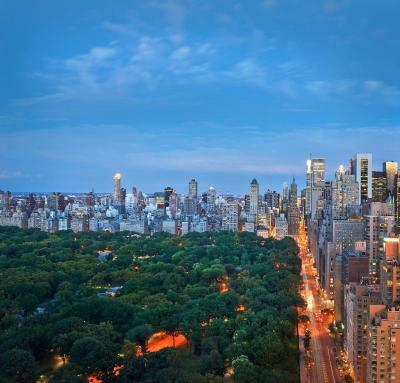 House Rules Mandarin Oriental New York takes special requests – add in the next step! 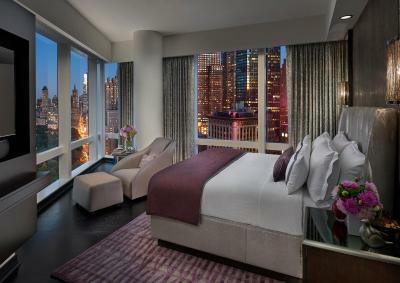 Mandarin Oriental New York accepts these cards and reserves the right to temporarily hold an amount prior to arrival. The Spa will be open from Monday to Friday from 16:00 to 22:00 hours, on Saturday from 9:00 to 21:30 hours and on Sunday from 9:00 to 20:30 hours. 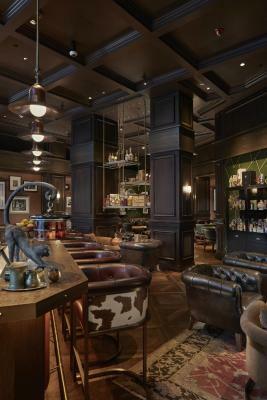 The lack of a more intimate environment that you find in boutique hotels on the upper eastside like the Lowell, Carlyle, Mark, and Surrey. I realize this is a different product due to location and this is not a fair comparison. The bed was like sleeping on a cloud, the bathroom was huge, and I had enough space to spread out all my cosmetics. The shower was magnificent, exactly what you need after a day exploring the city. I mostly enjoyed Sunday breakfast, the views where breathtaking, a copy of the New Yoke times and delicious onion bagel. The staff were so attentive, apparently there was an issue with my booking however they handle the issue with out me even knowing there was a problem at all. Best service I have experienced ever! Will definitely be back. It would be nice if there was some way to communicate when I don't need new shampoos or body soaps. They replace them daily, which is nice, but most of the days, I did have lots left and felt guilty about generating trash. 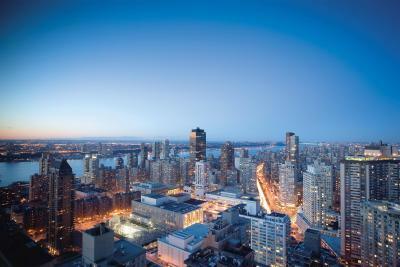 I’ve stayed in hotels around the world so I’m fairly knowledgeable about what to expect from a five star property. 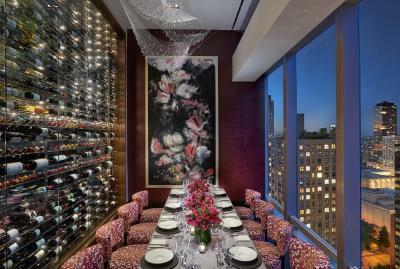 I’d say the Mandarin Oriental in NYC is an above “ average” experience but most certainly not the kind of experience that one might expect. 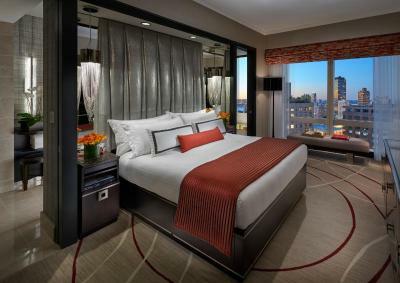 It’s like a vamped up version of a Hyatt. Food is just fair. 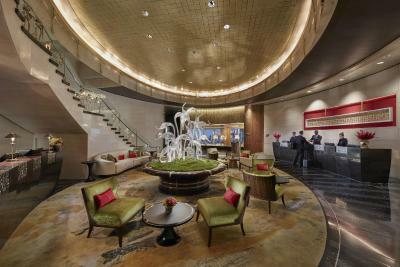 The general ambiance is like a busy city Hyatt. Spa completely average and totally overpriced and COLD in the “relaxing” room. Rooms nice enough but nothing too special. I am certain there are many hotels just like this experience at half the price. The spa was the most obviously disappointing experience as I expected a zen like experience. It just wasn’t. In general, a nice enough hotel but way way overpriced and overrated! The Mandarin used to be the place to stay but I suspect they’re losing their exclusive cache in the marketplace based on what I’ve experienced! I understand this is NYC so everything is extremely expensive. I found the room to feel a bit smaller than expected for the price paid. Although the room was overall very clean, under the bed was dirty. It looks like they don’t ever vacuum under there. 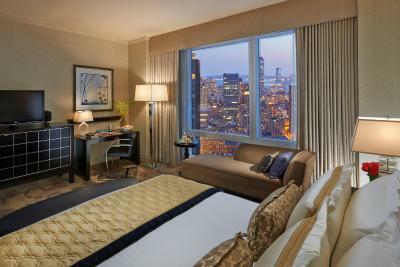 Room, view, surroundings .. are just perfect. They messed up our room reservation and gave us a king instead of 2 twins. 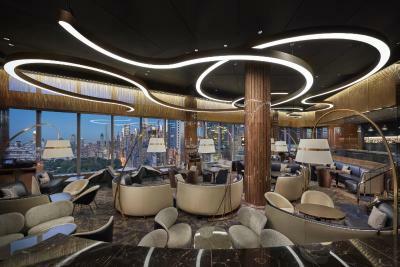 They moved my friend and I down from the 50th floor to the 47th after they tried to put us on an even lower floor (37th) with no view just because the room would be ready quicker mind u we paid over $1000 for a nice room with the river view. Anyways the room we ended up staying in had way less of a view. The mini fridge wouldn’t open in our new room, they didn’t bring us waters when requested, were rude to my friend and I not sure why maybe because we are young. I’m 21 but like around 18. Also they charged us a random $21 fee after we already paid the for the room in full upon arrival then told us they it’s because their co worker messed up which he did not because when I booked it was $1125 then they told me it was 1145 when checking out so I had to hand them more money when leaving mind you my friends and I didn’t use any services from this hotel... terrible customer service I am very disappointed with our stay wish they would have offer a small refund but nope I had to pay more lol!